Which card is worth to buy? Sapphire is a cheap brand which is well known as the brand with highest failure rates (not counting with chinese brands). The 580 and the 1060 have a really similar performance, but the 580 consumption is higher. The 1060 is clearly a best graphics card BUT you won't be able to use your monitor's Freesync. If you can get a 480 or 580 from any other brand at a similar price, it would be the best choice. shappire rx580 nitro+ omg... bro nitro+ is probably the best cooled for rx 580. Shappire is like Evga to Nvidia, good stuff not bad. Rx 580 is good as gtx 1060 or even better look at the newest benchmarks with finewine amds drivers. Nice cooling and/or overclock has nothing to do with components quality and durability. Myself have got in my hands a broken Sapphire 480 within a year of use. They're just much less reliable than any other brand, despite any other facts. And a very, very slight improvement in performance or cooling just doesn't justifies taking the risk. I have to agree with lubosblacksmyth, sapphire is one of the best AMD video card makers, indisputably. They produce high-quality products and none of my friends who own sapphire equipment has even complained. Aside from the NITRO+ being a substantially potent lineup, cooling and clocks are essential parts of a video card, so yes, they are related with component quality and durability. In conclusion, the sapphire rx580 nitro+ is a good choice which will utilise freesync and will offer great performance in the long run. I'd be comfortable buying an Asus, but not their most expensive one unless you want all that rgb stuff. I'd pick one of the mid level 1060s. I don't see Sapphire in the same low budget tier as Powercolor, but I'd probably go with Asus or MSI for AMD cards. The guy has a freesync monitor so AMD comes handy. Yes i dont support nvidia, bad very bad practises for us consumers and their stuff so expensive. I am not saying they make bad cards but freesync and now cheap amd cards after mining crisis is solid. Also there is nothing wrong with sapphire cards at all. It's just lucky that none of your friends had any problem. But it's as simple as your friends isn't a representative fraction of the market. What is representative is Sapphire being one of the brands which more failures are seen reported in the internet compared which any other brand, not only AMD but including Nvidia. The 580 Nitro+ is additionally using Micron memory chips, they work but they're just far of the overclock performance that Samsung or Hynix chips give. The factory overclock can be higher, but it's pointless if the other brands cards can be easily overclocked over this one. OK, this failure rates are from 2013, but I haven't really seen any improvement in this last 5 years, same amounts of complains. I'm not going to provide you with any forum links that prove sapphire is trustworthy, because I count on you being able to do your own research and I assure you, you will find thousands of threads bolstering my claim. Gainward gets the lead, with Sapphire in an obvious last position due mostly in part to their 7870 models, which when removed from the equation reduces Sapphire's failure rate to 2.06%. 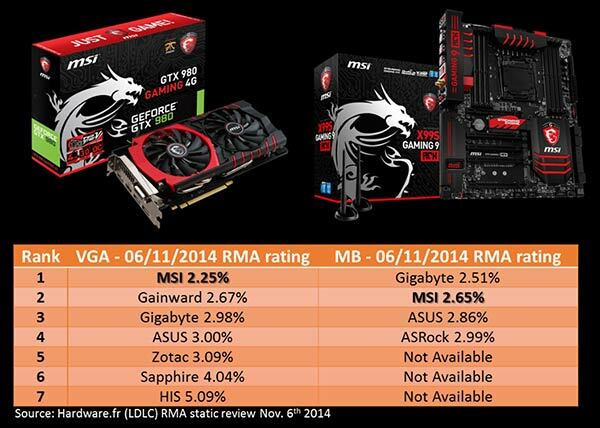 2.06% doesn't stray very far from ASUS's 1,69% or even MSI's 1,81%. And yes, their 7xxx series may have been junk, but not a lot of people look for a 7870 in 2018. However, I'm not rigid about technology, so should you find any research conducted after 2016, then I will probably believe you. Until then, Sapphire remains an eminent brand, at least for me. After all, the question was about a NITRO+, not a video card that came out 5 years ago. 7870 is an early 2012 graphics card. They had plenty of time to improve the reliability of the cards. Anyway I just found a late 2014 report, a yer and almost a half after Rx 2xx series was released. I don't even know what brand is HIS, which can be explained by being even worse than Sapphire. Anyway, and without counting that (chinese?) weird brand, Sapphire is still the worse. OK, still data almost 4 years old, but I just cannot find sooner reliability studies. I think this is an interesting matter to discuss, and we have tons of fire proofing nowadays with mining rigs. I think I'll just start a discussion so miners can tell us what happened with their hardware after hard work. Even though you are going through the effort to provide all this info, its highly irrelevant to this discussion. Yes, historically they had a marginally higher failure rate, but this is not an valid indicator of the current market. Personally, a 2% higher failure rate for superior cooling and noise is certainly worth it, considering they all have similar warranty periods anyway. Sapphire is the same manufacturer that can keep an R9 290 under 60C at load with under 50% fan speed, that is easily worth the extra "risk". All and all, its just your opinion with data from old sources, you really cant go wrong with either choice. I'm not who decides if it's irrelevant or not, is the user who doesn't know what to buy, and you shouldn't just ignore that. A 4% failure rate even being a low percentage isn't a really low value, you're just daily buying twice participations in the lottery of hardware failing by buying a Sapphire than buying a MSi. And about HIS, they don't even sell in Spain, and when researching about graphics cards in international forums I've never seen that brand mentioned, I don't know if in your country that brand is popular or something but internationally it seems almost unknown. Ive had 2 cards fail ever in what Id consider an unacceptable time/ use duration. In that context (If I followed your rules) I should never ever recommend MSI again ?? However I just consider that bad luck on my part,admittedly its pushed me to steer clear of MSI products from now on (one of the RMA's was an absolute nightmare) but I woudl never push a sweeping generalisation that theyre cheap & prone to failure just on my own experience. Their IceQ models of the old hd7*** series & r9 280/290 series cards were amongst the best on the market,the iceQ cooling was phenomenal on these cards,look at pages 8/9/10 on that link. I have a 7950 that is still working absolutely fine. Vice versa a powercolor 7870 xt myst & a turboduo 280x,both some 6 years old still working fine & they too are a brand many consider lower tier & lower quality - the turboduo is imo one of the best 280x models ever produced,certainly better than the asus dc2 which was regarded as the best model ,oddly apart from the Sapphire Toxic which was 100% the top card in its class. Im running a Sapphire Pulse rx 580 at the minute,14 months old , not a single issue with it, Sapphires cheapest twin fan model & still insanely quiet & very very cool running. I'm just getting out of the discussion. It's pointless for me to keep showing data if all your arguments are your personal experiences, "your dismissal of HIS without doing research does not bode well for your argument", "its highly irrelevant", that kind of arguments, opinions based in personal experiences and downvotes.